Yes, we supply new parts for many cars built in England. We have a expansive inventory of vintage new old stock Lucas, Girling and Lockheed parts such as lamps, lenses, starter parts, generator parts, wiper motors, wiper parts, switches, relays, bulbs and many other parts these companies made. Some of these parts date back to the 1940's and stop in the mid 1980's. Some of the original boxes have disintegrated and we are slowing identifying and cataloging these mystery parts. We also have an expansive inventory of new old stock 1970's-1980's Jaguar factory parts and we have quite a few new old stock BMC, British Leyland and Stanpart Triumph parts. We have a extensive inventory of Vandervell, Glacier and Repco rod and main engine bearings for many vintage cars such as Alfa Romeo, Vauxhall, very early Jaguar and many more. Some of these rod and main bearings have been about impossible to find for many years. Rolls-Royce and Bentley Parts, Jaguar E-Type parts, Jaguar XJ6 and XJ12 Series One, Series Two and Series Three parts, Jaguar Mark II parts, Jaguar MK X parts, MGTD and MGTF parts, MGA, MGB, MG Midget parts, Triumph TR3, TR4, TR250, TR6, Stag and Spitfire parts, Austin Healey parts, Austin parts, Morris parts and Aston Martin parts and parts for many other British cars. We also offer Mercedes Benz parts for many vintage models. If your engine has not had the radiator coolant and heater supply hoses replaced in the last 8-10 years or ever then the rubber is near the end of life, is dry rotting and could burst like a mini solar flare without warning. Boom! Coolant will erupt from a burst hose like solar plasma out of the sun ( not really but the dramatic effect...) causing the engine to rapidly overheat. An overheating engine can fail in catastrophic ways ranging from blowing a head gasket to cooking and warping the cylinder head to melting the pistons, seizing the engine and it's all over except a huge bill. We offer very cool all aluminum highly efficient radiators for many cars. Each are works of radiator building skill and the art of welding. If a highly efficient radiator is amongst your automotive desires we can likely supply it. Observe an aluminum radiator installed in a highly modified Triumph TR3 that features a supercharger, ported and gas flowed cylinder head, performance camshaft, high flow waterpump, electric fuel pump, stainless exhaust headers, an oil cooler and much more. Not for purists. This is an aluminum radiator for mid 1960's Jaguar E-Types with a modern electric fan attached. This radiator is also available without the fan. An aluminum radiator is trial fitted (for the purpose of this photo) on a highly modified 1972 Jaguar E-Type Coupe. This car was being fitted with a five speed transmission, six down draft Weber carburetors, stainless steel exhaust, headers, all new wiring, rebuilt and new brakes, rebuilt suspension, rebuilt differential and steering, new wiring and much more. In the 1960's, Lucas offered this accessory hazard warning switch panel so cars built without this essential safety feature could have it. This assembly is still made on the original Lucas tooling and we still supply them. It fits under the dash on any British car that has space for it. No instructions as many cars have the wiring in different places but the color codes on most British cars regarding indicator wiring is the same. You decide where it would fit to suit. Regarding Jaguar cars, we have a great many very scarce new old stock factory parts for Jaguar XJ6 Series One, Series Two and Series Three, XJ-S all models and XJ12 cars from 1969-1997. We also supply many parts for all Jaguar E-Types and offer parts for 1950-1997 cars such as Jaguar MK I, Jaguar MK II, Jaguar MK VII, Jaguar MK VIII, Jaguar MK IX, Jaguar MK X and 2.4, 3.8, 4.2, 5.3 and 6.0 V12 engines. We supply parts for Jaguar 420, Jaguar 420G , Jaguar 3.4S and Jaguar 3.8S models. For MGTD and MGTF series we supply a great many new parts and have some original used parts in great rust free condition such as MGTD rear fenders, a good transmission for MGTD or MGTF, a good solid frame for early MGTD with Girling shocks, front and rear brake drums, drive shaft, rear springs, a nice complete windshield frame with good glass, a Right Hand Drive dash, front and rear Girling shocks and much more are in stock. Let us know what you need. This lubricant is great for manual steering boxes like those used used on big Austin Healey, Triumph TR3, early Morgans, MG Magnette, Bristols and many other models such as Jaguar XK120, MK 7,8,9 and all cars with manual steering boxes. Not for cars with steering racks. While we supply many parts for modern models, we also stock a great many parts that may no longer routinely exist in the routine world of car parts as over the last 40 or so years we have bought many inventories from firms that were closing down. We have many new old stock original Lucas switches, fuse boxes, wiper parts and motors, lenses, lamps, starters, ignition, alternators, parts of generators and alternators, Girling and Lockheed rebuilding kits, cylinders, hoses, BMC, British Leyland, Jaguar (pre 1987) MG, Triumph, Austin Healey and many more parts of all sorts for British cars and Mercedes Benz. Before we discuss specific parts let us discuss parts specifics and definitions. 1. New Old Stock or NOS- Many of these parts were made by the original manufacturers to original specifications and many of the companies no longer exist. New Old Stock parts may have been manufactured 10, 20. 30. 40 or 50 years ago or more. These parts usually have no return privileges because suppliers such as ourselves have no one to return them to. We happily buy such parts as-is and sell them the same way. The good thing about such parts is they are of original build quality and are much better than reproduction parts in many but not all circumstances. In our shop, we usually prefer NOS metal parts when available. However all NOS parts do not age well such as hydraulic assemblies or rubber parts. When we sell a NOS brake master cylinder for example, we recommend replacing any rubber parts as this action ensures a good installation without leaks. 2. Rebuilt or remanufactured parts. These are assemblies that are supposed to be rebuilt as well as can be done and are sold on an exchange basis with a refundable core charge applied for the return of a good rebuildable assembly. Rebuilt parts require new parts to be used in the process not just a coat of paint. There is no end to variances in the quality of rebuilt parts as the quality standard is entirely up to the rebuilder. Some rebuilders goal is to "fix" something as cheaply as possible with no regard to quality. These companies have zero pride in their work and leave bad experiences in their quest for easy money. There is no easy money involved with rebuilding anything properly. A poor "rebuilding" process may just involve polishing and painting or poking in a new seal here or there. Other firms such as ours strive for a high standard such as makeing the assembly as close to new or even better if possible. Price sometimes is not a determining factor as some rebuilders ask as much for their trashy product as quality firms ask for good stuff. The bad rebuilders depend on the ill informed to sustain their business and there is no lack of business for them it seems. For the above Jaguar models we supply all manner of new parts. Electrical parts are not returnable because there are those that will install parts into a car with an electrical short in the electrical system and fry the new part or they install the part incorrectly and burn it out or damage it. These people will usually claim the parts are defective and as they don't want to be responsible for their decisions will want to return the part. Other people will buy and use an electrical part such as a relay or alternator to test their car with and if it does not fix it, they want to return the part. However the part is no longer new and suppliers cannot sell it as new if it has been fitted. When confirmed that a part is not returnable some people may say, " But it did not fix my car." No electrical part is ever sold with the guarantee it will fix a car problem unless the part has magical powers. Parts with magical powers are clearly marked and are more expensive. 5. Rebuilt parts are not returnable but we do exchange or fix them on the rare occasion there is an issue within the warranty period. 6/ Special orders are not returnable. Many manufacturers do not want special orders back so we are stuck with them if a client refuses to pay for them. We do not want to be stuck. When we do a special order the order cannot be canceled once we turn it in to the factory so we take full payment in advance with the order. Specials are parts that we do not stock and don't want to stock. We do our best to stock parts that people actually need and want to buy on a regular basis. However as we nor any supplier can afford to stock every single part that was ever built we special order parts every week for our shop and for clients and are happy to do so. 7. If a part still being manufactured is found to be defective within a manufacturers warranty period then we replace it or sometimes such parts have to be returned to the factory and they decide if it will be replaced or repaired. These issues are on a case by case basis depending on the makers policies. The good thing is that we find very few defective parts. 8. Reproduction parts. Some are very good, others are very bad and others are worse than bad. If the original maker no longer supplies a part and the part is being reproduced, it may be good or bad or just plain ugly and may be the only part available. The end user has to work with the part, machine it or otherwise work the part to fit and work well. This is just the way it is. While we are universally renowned throughout the universe for supplying new spare parts for Bentley and Rolls-Royce cars, we do supply a great many new parts for certain other marques. We supply new parts for Jaguar cars built after 1996 as well but the earlier cars are our forte. As we have rebuilt, restored as well as serviced all of the above Jaguar models over the last 42 years, we should have little difficulty in knowing what you want unless our brains are tired and we want to go home. We stock new MGA brake drums, brake shoes and water pumps. We rebuild any MG transmission. XK-120 rear axle differential assembly with one brake backing plate. We have a single new old stock Burgess exhaust comprising the headpipe and muffler for an early Jaguar XK120 Coupe. These were the best and this one is likely the last one on the planet. 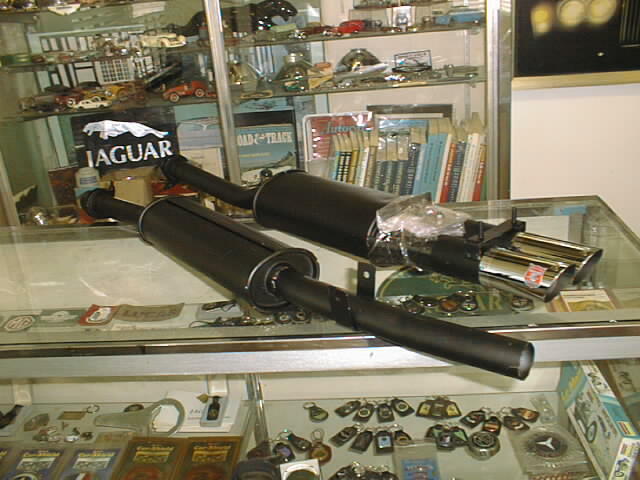 We have new old stock mufflers for XK140 and head pipes as well. More to be listed later. We have a new old stock Austin 4 Litre R head gasket. These are very hard to find these days. This Austin featured an engine supplied by Rolls-Royce. We have a very limited number of new old stock mufflers made by Harmo, the original manufacturer for Triumph TR250 and early TR6 as well as GT-6. These were the best stock systems ever made. Austin Healey 1954-1971, Austin Healey 100/6 parts, Austin Healey 3000 parts, Austin Healey Sprite parts. Austin A-40 parts and Austin Marina parts. For Austin Healey Sprite we have a very limited number of new old stock original Harmo mufflers. For Triumph GT-6 cars we have the rear hatch glass rubber seal in stock and original Harmo exhaust. For a Volvo P1800 we have two used headlamp trim rings and for a Volvo 122S we have a generator, why I don't know. We have an original new old stock BMC made front bumper for Austin Healey 100/6 and 3000. The part number is 11B5303. Still has the old protective tape on it. Ready for that almost perfect car. We have a lot of original BMC parts such as a new old stock hood (bonnet) for an Austin Healey 3000 or 100/6 still wearing a BMC sticker. Perhaps this one is the only remaining new old stock bonnet left on the planet. Bristol (We supply a new Pertronix Ignitor III distributor for the Chrysler engine models like the 407,408,409,410 and 411 ) and also supply brake and suspension parts. Yes, we offer new parts for all the above MG cars and having restored and rebuilt all of these cars over the years. We know them well. For Jaguar MK IIIX or MK 7. Jaguar MK IIX or MK8 and Jaguar IX or MK 9 we have a good used back glass and a front windshield for MK 9. We have for the 1960's Jaguar 3.8S and 3.4S, a new old stock grille and new old stock rear exhaust resonators with connecting pipes. We have over the axle exhaust pipes for early XJ6 and some original headpipes for Jaguar MK 9. We have a complete set of four new old stock front wheel cylinders for a Jaguar MK VII. Long unavailable. We have a pair of old stock exhaust headpipes for the Jaguar V12 E-Type. Windshield glass? We can supply new laminated front windshield glass for Austin A30 and Austin A 35. We sold the last of the Austin A-40 Somerset glass. Not sure if we will offer these again.We can supply new windshield glass for a great many cars so just ask. We have available a new front windshield or windscreen glass for A60 1960-1970 Farina body MG Magnette and Austin Cambridge, Wolseley and Riley series cars. We have a new tinted Triplex Syndym front windshield in stock for a Jaguar MK II. For 1980's Maserati Bi Turbo and Biturbo Spyder a new front windshield is in stock. We supply parts for many vintage Mercedes Benz cars such as 190, 220, 300, 220seb, 300sel 3.5, 4.5, and 6.3, 420sel, 190sl,230sl,250sl,280sl, 350sl,450sl, 500sl,560sl, 600 Pullman and many more. Please send the VIN with parts requests. Concerning all Mercedes Benz cars from 1960-1985 or so there are many rubber based mounts that will be very deteriorated by now. These mounts hold the suspension systems to the body. These are many other rubber parts and they should be inspected as if these mounts have perished, the car will wander and have a poor ride. We supply subframe mounts for just about all models from the 1960's w108, w109, w110, w111,w113 models on and have have extensive experience rebuilding these cars so have a good idea of what your car may need. We supply many parts for Morris Minor and many other British cars. We offer new KONI shocks for Triumph TR3, TR4,TR6 and Spitfire. We offer Koni shocks for many Jaguar cars and many other cars as well. We have a large stock of new old stock Jaguar XJ6, XJ12 and XJS parts circa 1969-1987 such as bumper chrome, windshield trim, lot of mechanicals and bits long discontinued. We have a considerable inventory of vintage Lucas switches, lenses, lamps and more that fit scarce cars such as Hillman, MG 1100, Austin America, Austin Marina, MG Magnette, Sunbeam Alpine, Jensen Interceptor, Standard and many more British cars. You never know what we have until you ask however we don't sell used carpets for old cars. For a 1973-1976 Jensen Interceptor we have a new old stock turn signal switch Lucas 39551. For Sunbeam Tiger we have a NOS turn signal switch and we have many different turn signal switches for a variety of British cars. When we say we have billions of car parts we say it with the same sincerity politicians though out the ages have, give or take a few million here or there...and don't quote us. While we are mostly about NEW parts, we do have a LOT of used parts available from our steadily diminishing collection. We supply a vast vast vast array of new parts for classic Jaguar cars such as Jaguar XJ-S, XJ6, XJ12, MK10, MK2, MK1, E-Type, XK120, XK140, XK150. Here is a original new old stock flywheel EAC8973 for all 1974-1987 Jaguar XJ6, long gone from the factory. New and perfect. Our goal is not to supply the cheapest imaginable parts. We aim to supply the best possible quality parts for people for whom quality matters. For car owners that shop by price alone and don't care about whether the parts fit or not, there are other places that well serve this market. We offer certain new parts for 1960's Bristol cars, primarily the Bristol 409. We can supply ball joints, suspension bushings, brake parts, motor mounts, many electrical parts and some steering parts. We have quite a few vintage Vandevell engine bearing sets for many vintage British cars and lots of original vintage NOS Lucas spares. Tell us what you need. We supply wiring looms and parts for many British cars going back to the 1930's. We have in stock a complete wiring loom or harness for a Austin A-40 Somerset. We also have a super rare C44214 new old stock Jaguar dash loom for a XJ12C or XJ12L. This harness is very likely the only one to exist. We also supply wiring for Armstrong Siddeley and lots of great British cars. Since 1976 we have been one of our planet Earth's favorite places to purchase parts and accessories for English cars. Don't worry about part numbers. We know the cars well and can usually take your description and work from there to give you the best price and availability. We offer fine quality wiring looms and convertible tops for just about any car manufactured in a large range of colors and materials. Contact us for pricing. 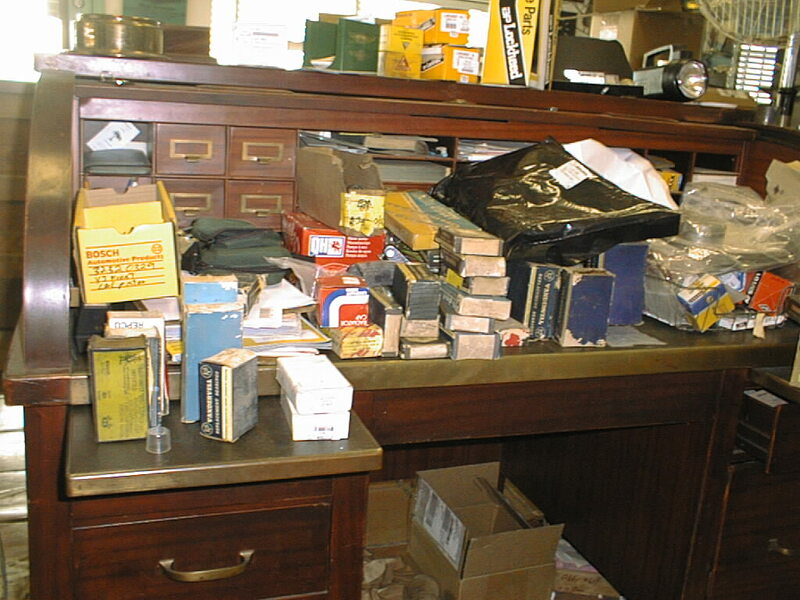 This photo is Scotty's desk after a week of identifying rare and obsolete parts. The desk is becoming visible once again but the situation probably won't last long as he just loves to Sherlock and figure out what new and unmarked ancient British car parts fit. Some of the packaging on new old stock parts are so old the labels have faded away and the boxes have disintegrated. The parts will be properly identified and logged into our database so they can be located when the need arises. We have many obsolete and rare parts available for a wide variety of 50's-80's British cars. Lucas Electrical, Girling brakes, Smiths Instruments, Vandervell engine bearings, Glacier engine bearings and lots of N.O.S. parts as well. We also have a lot of Mercedes Benz parts for 50's through 90's cars. We now have a few exceptionally rare new old stock 72-73 Triumph GT-6 brake master cylinders. These were just about impossible to get 30 years ago. Now they are more than merely impossible to find. We may have the only remaining world stock of them. We also have a few original Harmo exhausts for Triumph GT-6, early TR6 and some Spitfires. The highly sought after and appreciated by experienced Jaguar owners ANSA exhaust for Jaguar E-Types has not been made for some 25 years. 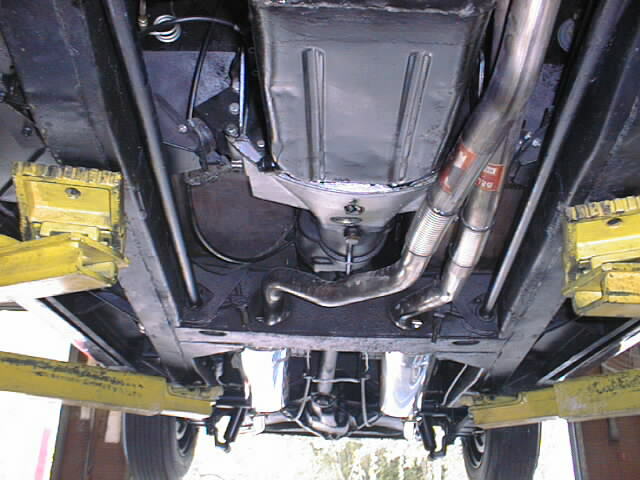 This system simply was the best sounding exhaust ever made for an E-Type. We have for a six cylinder E-Type, an ANSA silencer/pipe section that was installed on a display car that likely had engine running time of about an hour as the car was never driven after a restoration. The exhaust still has the ANSA sticker on it. It is therefore slightly used. With it we have a new old stock pair of ANSA chrome tail pipes and the three pieces are the complete ANSA exhaust system. We also have one complete new old stock ANSA system for the 6 cylinder E-Type. What are these ANSA systems worth? Who knows but we will when we hear the right offer. These highly attractive and well built ANSA exhausts are among the finest looking, sounding and performing exhausts ever produced. Contact us for prices and availability. For the Austin Healey 3000 BJ8, we have a new old stock ANSA exhaust system still in the factory plastic. These systems vastly improve the exhaust sound and last much longer than the original system did. They sound much better than any stainless system does. This ANSA system has not been made in some 30 years and this one is likely the only remaining new system in existance. Available for substantial offer. For a Triumph Spitfire 1300-1500 1971-1974 we have a single new old stock ANSA exhaust remaining. We also offer Bell stainless exhaust systems for MG Midget, MGA, MGB, Triumph Stag, TR4, TR6, Spitfire and Jaguar E-Type and XJ6. 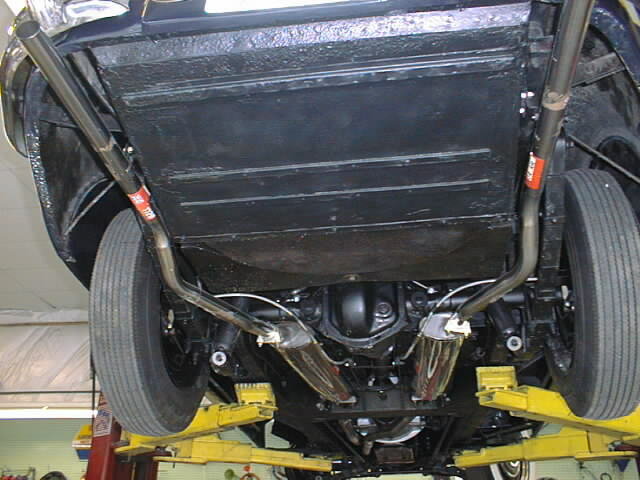 This is a Bell stainless exhaust system we installed on a 1956 Jaguar XK140 Roadster. We offer Bell stainless systems for most MG and Triumph cars. With exhaust systems, you definitely get what you pay for or don't pay for. Take headers for example. There are el cheapo headers out there. They don't fit well, they crack, they leak, they rust out fast. Cheapo headers break knuckles installing them and did I mention they are cheap? The best headers are made from stainless steel yet all headers usually require a bit of special fitting. 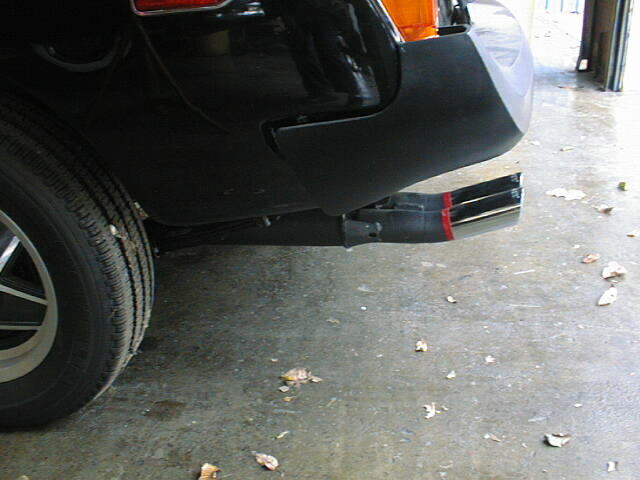 We hate cheap junky exhausts and consider them a waste of money unless there is absolutely nothing else available. Contact us about all exhaust needs. Rare parts? We have lots of new old stock rare parts such as new old stock right hand MGA Coupe door latch. We stock parts for the BMC Farina series of cars like MG Magnette, Wolseley 16/60, Austin Cambridge, Austin A60, Morris Oxford and Riley. Any part accepted for return must complete and be returned in the original packaging. The packaging must be in as good and in as clean condition as when sold. There are no returns allowed for any electrical part. There are no returns allowed for special order parts. There are no returns for parts that have been damaged. Parts must be examined after receiving them and are not returnable after 15 seconds. Now why is this so you may ask? To resell a part that has been returned, anyone purchasing that part will want it in clean unused condition. This is perfectly reasonable. We have had customers want to return a boxed part with the box and part drenched in dirty grease, hay and dirty handprints. (NOT!) No one wants to buy something like this and we are not in the trash business. Once upon a time, we had a customer return 16 Rolls-Royce brake pistons that were shipped back to us without any packing whatsever. The metal pistons bashed against each other as if they were in a blender and all of them had numerous gouges, scratches and small dents. The pistons were ruined. It is mandatory that expensive parts should be properly packed when shipping them or the loss can be expensive for the purchaser. Electrical parts are not returnable (unless they are found to be defective in manufacture in which case they will be replaced), because many cars have existing electrical problems such as a short that will cause a new part to burn out. Some people will purchase a new part with the intention of keeping it only if the part fixes their problem. If they guess wrong, then they want to return the part and "buy" another and on and on. This sort of thing abuses parts suppliers thus no parts house will accept electrical parts for return. Special orders are not returnable because such parts may take a long time to sell to anyone else and no business wants to tie up money in parts that gather dust. Core charges: What is a core charge anyway? Here is how the rebuilt/exchange parts business works worldwide. Think of the song in the movie Casablanca, "As Time Goes By". Certain expensive assemblies such as power steering racks, starters, alternators, water pumps, certain brake and electronic parts may no longer be supplied new. If a part is expensive or no longer available, the part may be supplied as a rebuilt exchange unit or firms such as ours will rebuild an assembly. Many parts are available as rebuilt exchange units. A core value charge, usually the full value of the part or more for the return of the old part is applied on the invoice with assembles that are shipped out to ensure the return of the old assembly so it can be rebuilt and maintain stock. Some cores are very valuable and hard to find so without the return of the old part, these assembles would not be available at all. So enough value is placed on the core part so it is worthwhile for the purchaser to return it and get their money back. Returned cores have to be in rebuildable condition. For example if a steering rack was involved in a collision and is bent or smashed, there is no core value or a greatly diminished value as the unit cannot be rebuilt. . Other cores may have sat in water or outside in mud for years and are damaged from rust. Damaged cores have little or no value but some people will send them in anyway and a few become angry or try to appear angry when their worthless core is rejected. All valuable cores are closely inspected before a core charge is returned. We supply a great many rebuilt parts and always prefer to have the core returned than keep the core money as the loss of a rebuildable core creates a loss of availability of the part for others in need. Some parts around the world remain unsold for many years or decades. These parts were new when placed into their packaging and after many years have passed the never installed or used part is called a new old stock part because it was new and unfitted and is now vintage and unfitted. The companies that made the parts are in many instances no longer in business or are no longer interested in making parts they made many years ago. NOS parts may not have a warranty as the original makers if still in business don't care about such parts. Most parts made of rubber are not desirable. NOS rubber parts are not like fine booze as they steadily deteriorate with time. A thirty year old water hose will not survive pressure and hot coolant for very long before bursting. NOS body parts that have sat around warehouses usually been moved many times. That such parts will acquire dents and damages from long storage is not at all unusual and is to be expected. This said, we have original water in stock for cooling systems available. The water is available in many vintages from the year 846 to early 2024. We are happy to trade for vintage Port of the same year. When we purchase new old stock parts, we dispose of parts that we do not think are good to sell to someone unless the part is kept for historical purposes. For an Austin Healey 100/4 we have a new old stock first gear with slider assembly. Part number 1B3576 still in the BMC box. To our collective knowledge this is the only remaining such gear in existance. We have a few Laycock A and J type overdrive units for Jaguar, Austin Healey and Triumph Spitfire. Parts Email or ring 281.448.4739 for parts orders or pricing requests. para sus piezas de automóbiles Ingleses y de Mercedes Benz"